Software vendors build mind mapping software and mind map tools for use of persons and enterprise companies. Using a mind mapping software or tool, brain storming and visualizing ideas about a problem becomes easier. I thought it is useful to review mind mapping tools for users who want to download and try this software or applications. MindMapping software helps to create a visual mind map of ideas around a central topic by connecting related thoughts, informations and inspirations on the mindmap to help the topic easier to understand. Mind Mapping diagram and the concept itself was first introduced by Tony Buzan as organizing ideas within minds of team members on paper to visualize and represent as a solid structure. For more on mind mapping, please read introductory tutorial What is Mind Mapping ?. I've recently download MindJet mind mapping tool and using MindJet for creating a visual graphs of my ideas on different topics. Actually I also learnt that MindJet is accepted as an enterprise tool in my company too. An other mind mapping software is iMindMap. I'm now going to try to list and introduce you these mind map tools and mind mapping software packages in detail. 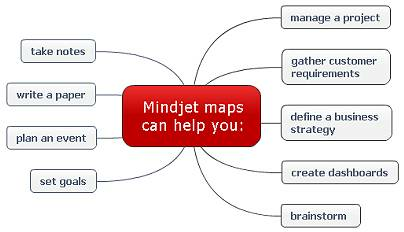 One of the professional mind mapping software packages in the market is MindJet for Windows. MindJet mind mapping tool has the advantage with full integration to Microsoft Office tools like MS PowerPoint, MS Outlook, MS Project, MS SharePoint, etc. You can think of Mind Manager MindJet for Windows as a collaborative mind mapping and project management tool for your company with its full integration to Microsoft Office collaboration tools. 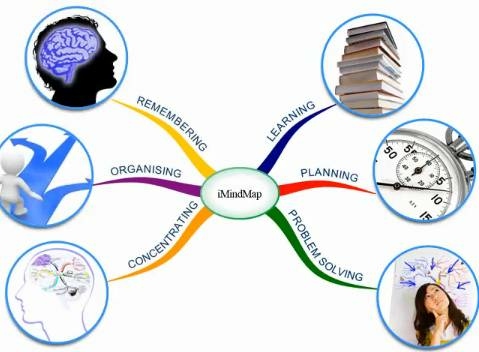 Here is a good ming map provided by iMindMap showing the benefits of using a mind mapping tool for individually and for organizations. MindMeister is one of Mind Mapping software which is commonly accepted as one of best tool for creating a mind map. It provides an online mind mapping and brainstorming platform for individuals as well as for enterprise users where MindMeister mind mapping software can manage teams. You can visit the official MindMeister web site for a live demo and a free trial period of 30 days. Users looking for a free Mind Mapping software can try FreeMind. FreeMind is also an opensource Mind Mapping software which can help you increase your creativity and productivity as well as any other mind-map tool. You can download FreeMind visiting the sourceforge.net web portal download pages. An other alternative for users who are looking for a free Mind Mapping tool is mind mapping software Edraw Mindmap. mind42 online mind mapping software enables hosted free online mindmap creation and online collaboration tools for groups working on the same online mindmap. All you have to start with creating an online mindmap is to register with http://mind42.com/ and activate account. You can then start mindmapping using this free mind mapping software, store them in your account or publish these mind maps. 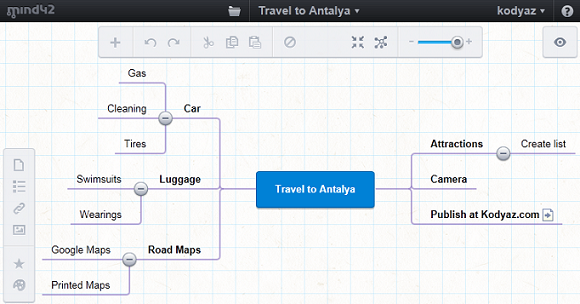 You can export to different formats and download your mind map. You can also invite other users in your team to collaborate and give permission to edit your mindmap. MindNode is a brainstorming software which you can download, install and use on your iPhone, iPad or on your Mac computer. MindNode also enables you to share your mind map with other mindmapping software like FreeMind, etc by exporting the mind maps into different formats including PDF. XMind is an other professional brainstorming and mindmapping software. You can download XMind, free edition or professional editions of XMind 2012 from http://www.xmind.net.